We ended up getting some king prawns with green tea salt and saffron and mozzarella arancini. 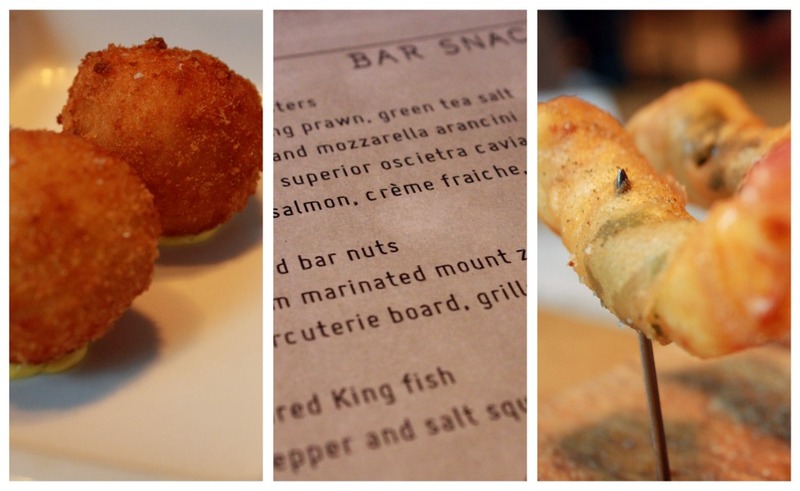 The arancini balls were meh, but the prawns were D-E-L-I-C-I-O-U-S! I picked at the salt flakes whist I drooled over the crazy wine list. make sure to have a look, there are some great stuff there. We hung around till 7.30 and then food team was assembled and ordered 1 a la carte and 4 degustations (of course) with matching wines. We had a choice of standard or premium wines and when premium…of course 😛 On to the rounds! Round one is a lovely glazed eel which was tougher than expected, however worked extremely well with the avocado puree and prawn cracker and this highly prized NZ Gewurztraminer was it’s white on rice. Nose was of creamy pear, like a full bodied cider withough the fizz. It matched the food perfectly, to the point that it seemed to be an extension of the food. The wine felt like the texture of the avocado puree and the eel was perfectly coated and finished off with a well rounded mouth feel. Best food and wine pairing of the night, but only just. A great start to the evening. If your a wine lover, you got to be excited about round two’s wine, a Corton Charlemagne. Oh and yeah, lets just throw 10+ years on that. What a treat. Such as exciting wine. White peach, mineral notes with some sea salts. The palate was granny smith apples, grass and straw. Odd, I expected more from this wine. However, add this to the food and BAM, imcredible. 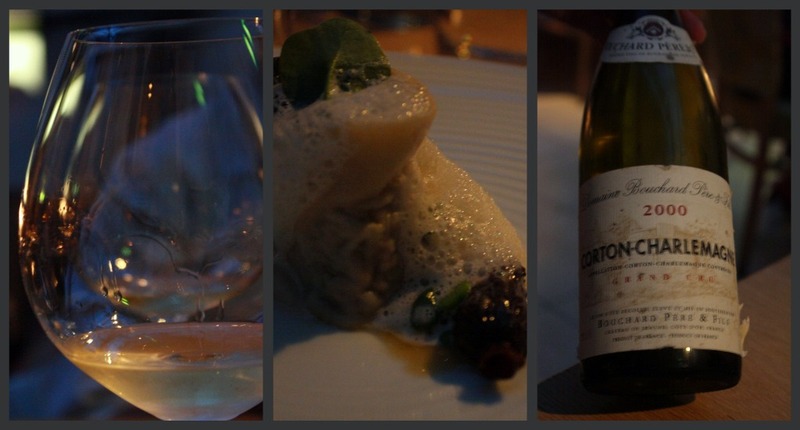 The food and the wine both bounced off wach other enhancing all the flavours, especially the jerusalem artichoke puree. The nose changed giving off a toffee/caramel aspect especially in the finish. The meal was not to be outshined and was personally my pick for the meal of the night. Delicate pasta and chunks of rabbit with an amazing sauce. A very close second/third in terms of wine pairing but will not complain, hell, I’m asking for seconds! Round three came with a rose from Heathcote made from 100% mourvedre which I thought was stange. Looking at the colour, you would not pick it to be rose, it had a strange golden/bark colour, almost like a sweet wine, nice and golden. Nose was extremely fresh and floral like potpourri. Beautiful acidity, subtle bitterness, some fruit balance. Reminiscent of a sav blanc. The fish was cooked well and the risotto was excellent, though I’m not sure it was regular risotto. It was almost like a fat sago, very smooth and almost bouncy. I liked it and the sea utchin butter was plate licking good. There was a downside to this dish, the food gave or enhanced a bitter finish to the wine. The wine did do a good job of cleansing the palate reading your mouth for the next bite, but you had a bitter taste in your mouth mading the wine not as enjoyable. We were able to snag another splash from our sommiler! I asked her about the pairing and she said it was more of a textural match and to also prepare your mouth for the red wines to come. After drinking the extra glass by itself, I think it got better over time, but matching the fish? I’m not so sure. Slightly dissapointed but we did come from a major high. Another NZ wine, this time from Central Otago. This pinot had a great nose of red berries, cassis, brambles, and makes you think of dry and arid bushes. Palate has some white pepper balanced with some sweet Asian spices, cinnamon and paprika. Light to medium bodied, some enjoyable heat on back end but again, well balanced with a touch of acid. Nice wine! The pork belly was solid, though nothing special and I wasn’t a fan of the ham beignet, tasted a bit like spam! Perhaps we were spoilt with the previous dishes? The pinot did a great job of cutting through the fat both on the palate and the taste. Well done and a solid dish, lovely pinot and well matched. Final round of the night was a treat. The sticky came with smells of honeycomb and port flavours. Not overpowering on the palate like a normal sticky, great mouth feel and balanced sweetness. Very impressive on its own. The dessert was gorgeous, both soft and cruncy and a effortless creamy texture on your mouth. With the dessert, the wine suffered and became overly sweet and somewhat unpleasant. 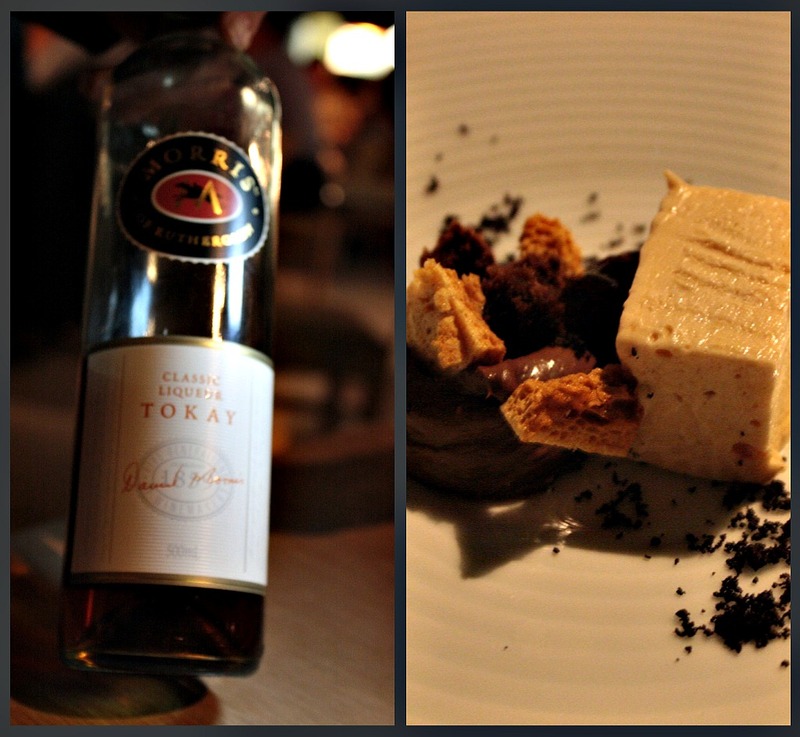 It brought out the alcohol which made me want to finish the desert first then the wine or vice versa. Not a good match but great individually. Sipped that wine throughout the rest of the night with a smile on my face. 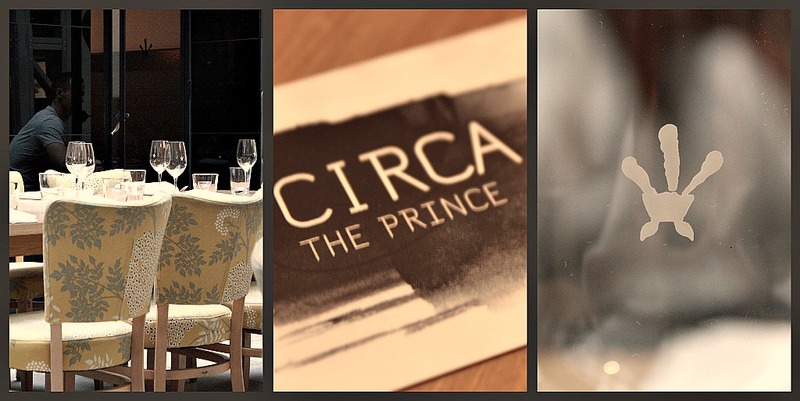 Circa was definatly an enjoyable experience. It was strangly loud in the rooms and had very funky ambiance with their own DJ. Very cool. The degustation will set you back $120 and then your choice of standard or premium wines at $85/$120. You will definately sleep well bring a wheelbarrow to roll yourself home.